Garlic has long been thought to be good for the heart. Researcher Karin Ried said: "Garlic supplements have been associated with a blood pressure lowering effect of clinical significance in patients with untreated hypertension. "Our trial, however, is the first to assess the effect, tolerability and acceptability of aged garlic extract as an additional treatment to existing antihypertensive medication in patients with treated, but uncontrolled, hypertension." She said: "This study demonstrated a slight blood pressure reduction after using aged garlic supplements but it's not significant enough or in a large enough group of people to currently recommend it instead of medication. "It's a concern that so many people in the UK have poorly controlled blood pressure, with an increased risk of stroke and heart disease as a consequence. 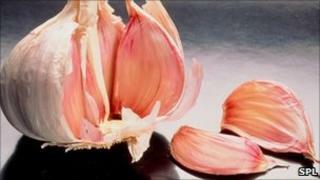 So enjoy garlic as part of your diet but don't stop taking your blood pressure medication."